Susan, a Louisiana native, graduated from Louisiana State University with a degree in psychology. She did further study at L'Abri in Switzerland. Susan and her husband, Mac, had three adult sons and five grandchildren. Susan had an exuberant, entrepreneurial, and pioneering spirit and was an active realtor for more than thirty years. She loved reading, gardening, and exercising her gift of hospitality. Kathryn March is originally from Minnesota and now lives in Brentwood, Tennessee. She graduated from Wells Colleges and has a master’s degree in counseling from Minnesota State University, Mankato. Kathryn has been married to Sal for 40 years and has two married children and five granddaughters. She has a special love for women’s ministry and has spoken at both national and international conferences. Presently, she works as an educational consultant for students. She is also an avid runner and enjoys sharing a good cup of coffee with friends. 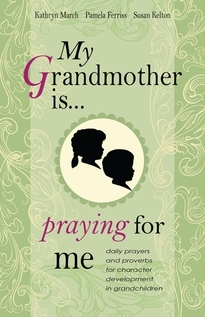 Anyone interested in learning more about Kathryn can visit www.mygrandmotheris.com.